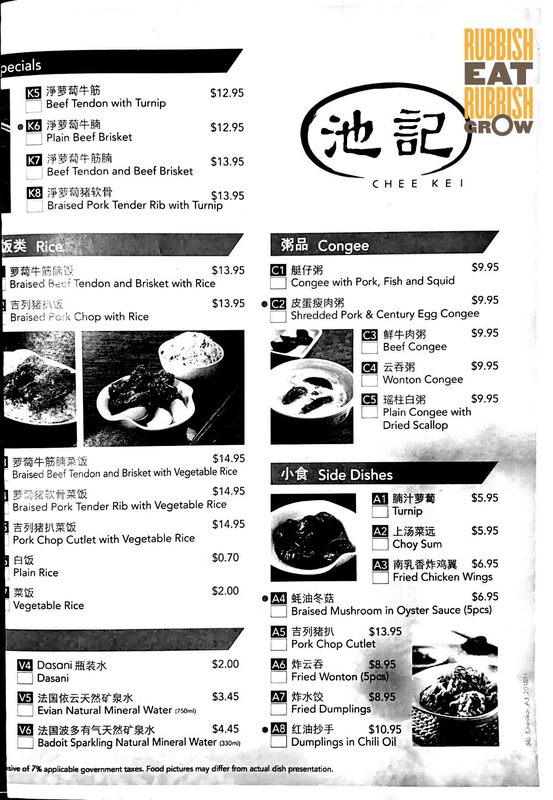 Chee Kei, which began in 1994 at Causeway Bay Hong Kong, has opened its first Singapore outlet at Changi Airport Terminal 2, sharing the premise with Ya Kun. They are famed for their wontons, and they also serve beef brisket and tendon with congee, rice or noodles. Michelin Guide Hong Kong Macau 2010 named them a “must-try destination,” although we shouldn’t confuse them with Bib Gourmand winner, Tsim Chai Kee, in the Michelin Guide 2018. 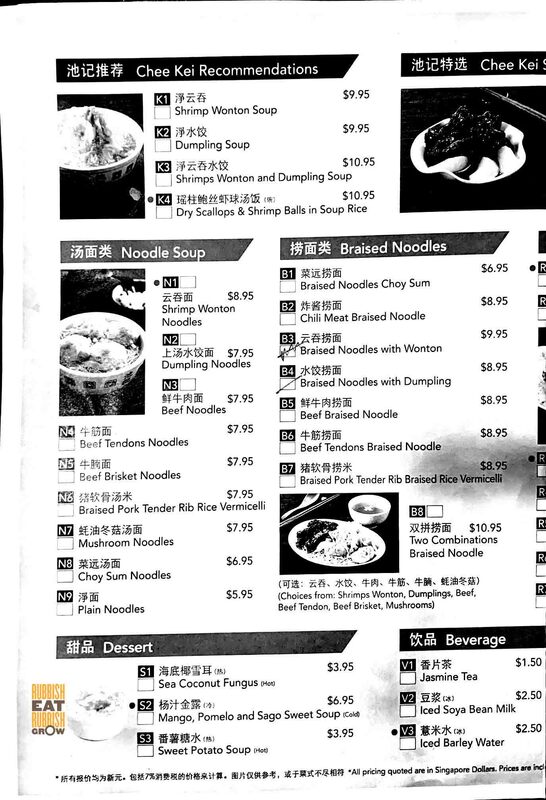 When I saw the two combinations braised noodle 双拼捞面 ($10.95, choose from shrimp wonton, dumpling, beef, beef tendon, beef brisket, mushroom), I wanted to flip the table. We chose wonton and tendon, and the serving was pathetic. The wontons are supposed to be “almost the size of ping pong balls,” according to one media outlet. I have also seen photos on other blogs that the serving size is substantial. But here, when we bought it, it looked as sad as singles shopping online on Double 11. The wontons were definitely less like balls, and more like miniature frisbee for smurfs. Mae, the server (manager? ), was super duper amazing, very good at her job. She appeased me by bringing the bowl to the kitchen to ask the chef. The chef said it was the usual portion, the photos on the menu are just for illustrations. She came back to say sorry even though it was not her fault at all. She said she could try to add a little more ingredients. Her great service really made me feel bad. She’s a gem to the establishment. Between the wontons and dumplings, definitely pick the latter. The dumplings are plump with prawns that still have a crunch. The black fungus within gives it an umami and a nice crisp texture. Not bad. Both the beef brisket and tendon are decent too: tender and not gamy. Now the areas that can be improved: the noodles are so alkaline that they become astringent and choking. Many things, like the Hong Kong milk tea ($3.50) and the radish that comes with the brisket, are bitter. There is not much taste to the chilli. On the whole, the food is decent but not magical or life-changing. However, the great service by Mae did make a difference to our experience. The price is said to be 30-40% more than Hong Kong outlets’. We spent $60-something for three persons. If there is no queue, we don’t mind eating here before or after a trip, but if there is a queue, I’d rather eat somewhere else. –Mak’s Noodle 麥奀雲吞麵世家, Centrepoint: Will The “Best Wanton Mee in Hong Kong” Still be Best in Singapore? –Honolulu Cafe, Centrepoint: Famous Hong Kong Egg Tarts Now in Singapore!